Word up: my favorite Italian luxury brand is teaming up with my favorite big box store to create a whopping 400-piece line this Fall. As Carly Simon would say, "it's the stuff that dreams are made of". At least the kind I have :) I adore the signature Missoni zigzag print and have longed to have just a teensy bit of it in my own life, but have been swayed by the price tag. This feels like my big break! 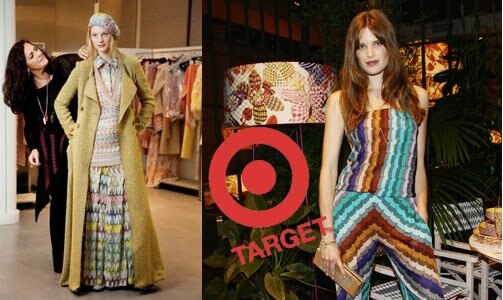 Apparently the massive line will include everything from womens, kids and men's clothes (honey, prepare yourself to go shopping--I'm giving you a good 4 month's warning here) to bed sheets and dinnerware--all in Missoni’s iconic style. The much-anticipated collection debuts Tuesday, September 13. See you there! I just saw this today somewhere. So excited!! Did you see the Missoni feature this month in Bon Appetit?! Made me sooo happy. Love that they are collaborating with Target. I looked through the Calypso line earlier this week. I thought I would like the womens line more....But I loved the girls stuff. It was darling. Had to hold myself back and remember I was there for bike parts. ha. Lindsey, I came home to a stack of magazines and one of them is Bon Appetit...I''ll look for the feature. I love Missoni. In Italy once I almost bought a coverlet with all of my hard-earned spending money. But then couldn't bring myself to do it. I can't wait to see what they come up with! I hope it's fabulous! I love almost all of Target's designer collections, but I am over the moon to hear about MIssioni. I love Missioni graphics, but the prices are way too high. target prices are much more doable! Can't wait to see this hit. Wondering what the $500 Target piece will be. oh yeah, bring it on, target!